Awesome Vacation on the Lake! A vacation at Reunion Beach is one you’ll remember for a lifetime. We have an 8 person hot tub, so guests can relax while enjoying the view. Head down to the edge of our property where it meets the water, and you will find a wonderful cove offering a great place to swim, fish or try out our canoe (free use for our guests), or just hang out on the water's edge and take in the beauty and the warmth of the sun as you enjoy a cool beverage by the lake. No need to drive to a marina when you can anchor your boat in the cove of Reunion Beach. Boat and jet ski rentals are available at either of the nearby marinas. A free boat ramp is less than a hundred yards away. Head out to the open water to tube, ski, wakeboard or fish for the big ones. Reunion Beach House is a beautiful, newly remodeled A-frame three bedroom, two bath home located on the shore of Canyon Lake. The very large two car covered carport is on the ground level. The living room (with two leather queen sized sleeper sofas), kitchen, two bedrooms, bathroom, and the large wooden deck are all on the first floor of the home (above the carport). The second floor contains a loft (with a full sized futon sleeper) and an additional bedroom and bathroom. Amenities include digital cable TV, central AC and heat, high speed wireless internet (free), a nearby (100 yards away) community recreation facility with a tennis court and basketball court. Canyon Lake is well known for its great fishing for bass, striped bass, white bass, crappie, perch and very large catfish. Children and adults thoroughly enjoy the experience of reeling in fish of all sizes while fishing from our beach. As one of the clearest and most beautiful lakes in Texas, you can’t help but have a great time on Canyon Lake. The cedar and oak woods are saturated with wildlife. The neighborhood is shared with pet-like deer. It’s a very calming and natural environment. Vacations don't get any better than this! The Canyon Lake Golf Club is next door to the neighborhood. Golf fee Monday thru Thursday is $27.00 w/cart and $17.00 w/out cart. Friday thru Sunday & holidays golf fee is $34.00 w/cart and $24.00 w/out cart. After 2 PM, Monday thru Thursday, $15.00 and Friday thru Sunday & holidays $20.00 w/cart. The Guadalupe River feeds Canyon Lake and has some of the best tubing, rafting and kayaking in Texas. It’s located only minutes from the home. Gruene Hall, Texas’s oldest dance hall, is located on the banks of the Guadalupe River with its famous live music and is only a short 15 minute scenic drive away. Gruene also offers great restaurants, shops and spas. While visiting, you may also want to take a day trip to New Braunfels, a quick 25-minute drive away. It is home to the world’s largest water park, Schlitterbahn, which is situated on the banks of the crystal clear Comal River. Situated between Austin and San Antonio, there are unlimited tourist attractions in the area. If your vacation plans include a trip to San Antonio to visit Sea World, Fiesta Texas, the Riverwalk, Natural Bridge Caverns, or the Alamo, we are only a short drive to US 281 or IH-35 to take you quickly into San Antonio. Austin, known for its live music and numerous exquisite restaurants, is only an hour drive away and is well worth a day trip or a night out on the town. Don’t forget to visit San Marcos with its famous Tanger outlet malls or the Power Olympic Whitewater Kayaking Center located on the San Marcos River. Day trips to heritage-rich central Texas towns, such as Fredericksburg, Kerrville, Johnson City and Bandera, Wimberley, Boerne, Blanco, San Marcos make us a top location for lodging. Here you can see for yourself what small town Hill Country living is all about. Many of these small communities have yearly festivals that are enjoyable to attend. For the shopaholics, Prime and Tanger outlet malls (which are the most visited attractions in Texas) are only a 45 minute drive away. Whatever your preference, you are within easy reach of a number of activities and destinations including: both wineries and breweries, Market Days, golf courses, shopping, and the numerous water sports and recreation possibilities provided by Canyon Lake and the surrounding Guadalupe and Comal Rivers. As a husband and wife team, Craig and I do our best to make your stay at Canyon Lake as relaxing as possible. I have been coming to Canyon Lake all my life, since my father began working there in 1967. Some of my most fond memories are of my siblings and me boating with my parents, having picnics on the shore, and eventually bringing our own children to the lake for holidays. Craig and I have shared many memories on the lake since we met in 1989, and we hope to bring that same joy to you! As parents of six great kids (ages 13-23), we try to keep our lake homes as "kid friendly" as possible. 23 years of raising children has made us experts at rolling with the punches, and we are always here to assist your stay in any way! We are happy to answer all of your questions about our lake house and the area. I hope you'll contact us today. Canyon Lake is the perfect location! The lake itself offers many opportunities for having fun, and it is conveniently located with New Braunfels, Austin and San Antonio closeby. Tranquility... The view and the surroundings are simply wonderful. Anchor your boat in our cove then walk to the patio which overlooks the lake. Our home offers easy access to the waterfront for sunbathing, swimming and kayaking. Canyon Lake offers waterskiing, wakeboarding, windsurfing, sailing, boating, fishing, etc. No boat? No problem! There are two marinas for boat rentals. Countless tourist attractions and shopping opportunities are within easy driving distance from this great lakefront home! Canyon Lake Country Club has a beautiful golf course and is just minutes away. This a great place to spend time with the family. Lake is only steps away and the house has everything you need. We had a wonderful time and already making plans for coming back! The only problem was a lack of hot water. We notified the owner as soon as we realized that there was no hot water. The hot water heater was replaced the next day. However, we were unable to shower or run the dish washer until late Sunday afternoon. We have stayed at Canyon Lake many times, but this was the BEST SPOT ON THE LAKE! Incredible access to the water We loved it and will be back soon! Thank you so much for staying with us at Canyon Lake. We are so happy to hear that you enjoyed your stay! We would love to have you return in the future. Relax, Chill, Relax, Chill, Repeat! We had a great extended weekend. We brought our boat and left it tied off to a tree and anchored at the back. It was nice being able to ski up to the beach and tie off our boat. We brought tent shades that we set up near the boat. Great time! Thank you so much for staying and for the great comments. We would love to have you stay with us again in the future. Exactly what we hoped for! Reunion Beach was exactly what we had hoped for! Perfect location, only a few minutes walk to the lake. The house was clean and comfortable. Would definitely stay there again when visiting Canyon Lake. Thank you so much for staying with us at Canyon Lake. We really appreciate it. We are so happy to hear that you enjoyed your stay. We would love to have you stay with us again in the future. My family and I absolutely loved our stay at Reunion Beach over Labor Day weekend 2018! The house was in the absolute most perfect location. 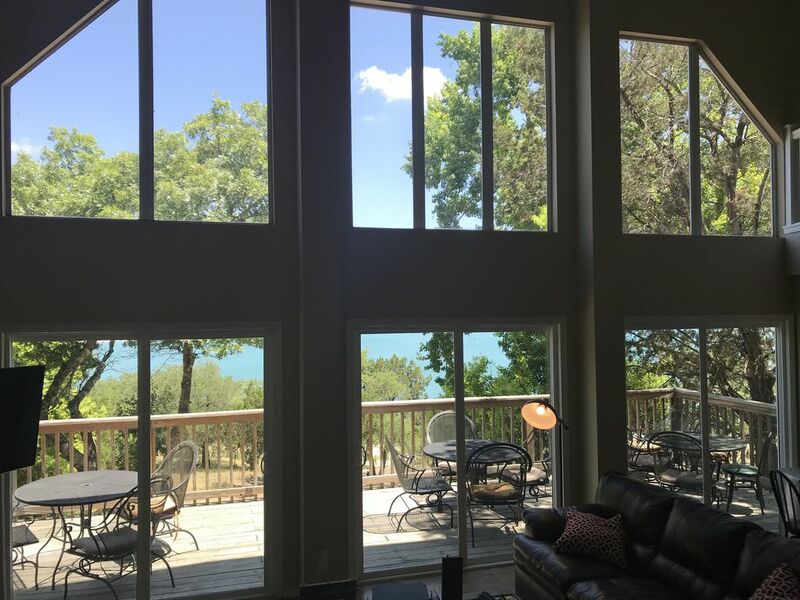 The lake views and access were priceless and the floor to ceiling windows gave us a perfect view from anywhere in the house. We spent most of our time down at the lake or grilling on the patio by the hot tub taking in the scenic views and evenings were spent hanging on the front porch playing corn hole and watching the wildlife. We couldn't have asked for a better vacation weekend and can't wait to break away and get back up there! Special thank you to Patty and Craig for their first class hospitality and loving care that they so obviously give to the property! God bless, from the Leyva and Medellin Families! Thank you so much for the wonderful review. Craig and I are so happy that you and your family had a great Labor Day weekend at Reunion Beach! Craig enjoyed meeting y'all at check in. We would love to have you and your family back in the future. Our goal is to help children have fun. In pursuit of this goal, we constantly feed the fish via underwater dissolving feeders in our cove which massively increases the number and quality of fish just off our beach. This provides children and adults the ultimate fishing experience!